Having a party? 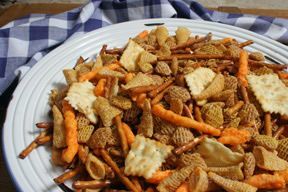 This is a great party mix for any gathering. It has a little of something for everyone. If you don't like one of the snacks, exchange it for one of your favorites. 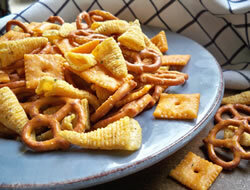 Mix together the snacks in a large zip-loc bag or paper sack. Mix together Hidden Valley Ranch mix, dill weed, lemon pepper and oil. 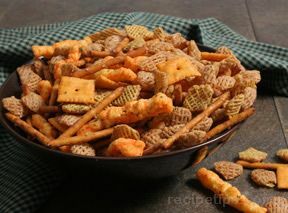 Pour over snacks. Seal bag/sack and shake well. OPTIONAL DRESSING: 1 bottle Orville Redenbacker Popping Oil, 1 T garlic powder, and 1 T. onion powder. "I made this to take to a party and it was great. It was the perfect thing to munch on with a cold cocktail. 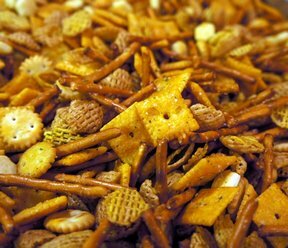 It made a huge batch but I didn't have much to bring home."